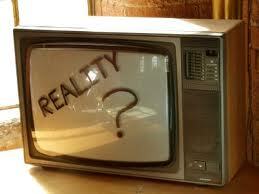 In 1992, MTV created the game changing series The Real World. It revolutionized and dumbed down television. Since then we have been flooded with shows that focus on elimination and highlighting failures. The popularization of legal voyeurism and the overwhelming interest in living vicariously through others has bled into other venues such as YouTube and blogging. How has this now overwhelming culture changed us? Out of every great change in technology or evolution of entertainment comes something ugly. People find a way to abuse what gifts we have been given and stomp on the responsibility we hold as an individual voice. It is a privilege that we all now have these venues to bring forward whatever it is we wish. The common man has been given an opportunity to share, respond and stand up for what we believe in. With all of these opportunities, you would hope that we would step up and take advantage in a responsible way; and many have. So where does it go wrong? It seems to hit rock bottom when people get so lost in this ability that they lose sight of its purpose. They go forth with no point. The system is abused and heavily laden in voices out to diminish and destroy. The number one problem falls with the overwhelming feeling of anonymity. Much of this is a false comfort as many don’t realize that everything can be traced. 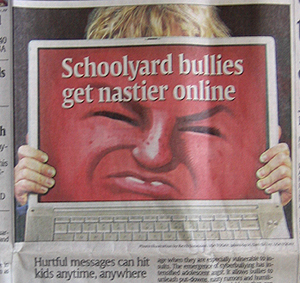 There is no law against being outright mean or any overall solution to internet bullying. We continue to foster this inappropriate activity by glorifying shows that center around making fun of others’ shortcomings or disillusions. We then encourage conversations which spur defamation and ignorance. When did people forget common courtesy or the ability to constructively criticize and argue? When someone can be anonymous, they for some reason use this power to tell some thirteen-year-old girl who puts herself out there vocally on YouTube, not that her attempts to sing were admirable, but that she is too fat and ugly. Yes, we justify this behavior by saying what this girl did was voluntary and that’s what comes with the territory. The same goes for famous people, authors, writers, and musicians. When did it go from sharing our art and passions to being the victim of every angry or vicious person that had a bad day? Why does putting something out in public take away the rules of decency or proper courtesy? This culture of wanting to always kick someone off the island and rising up in our anonymous voice to knock someone else down, is nothing but ugly. There is skin behind the computer and a life behind the television. 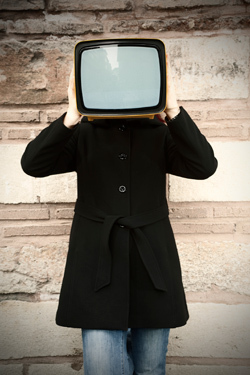 When did the primary function of television become voting on each other and pitting people against one another for ratings? Everything is a competition rather than a community or a means to commonly grow. There are plenty of people on the other side that have bought into it and made a life off of such reality disasters. They have accepted their fate in the public eye and made choices to remain there, even if in a negative light. In a way, we all put ourselves out there, but the general online population is just everyday people who are simply evolving with the technology and opportunities of today’s world. Humanity needs to be brought back to the reality of what this all is. We all share the same moon and stars and although many have no desire beyond their own two feet to be kind, those that have any moral compass should continue on with only respect for others. That means in all real-life and online situations. There is much truth behind the saying, if you have nothing nice to say… That is not to take away from healthy competitiveness or criticism. There is value in that as well. It is just surprising how many actually go quickly into bullying status. We all make mistakes. It is part of our humanity. But don’t attack a person for who they are or what you perceive as their personal imperfections. Don’t speak when you are angry, hurt or jealous. If you are going to reach out and affect someone else’s world, then don’t make it something dirty that can’t be taken back. Don’t be a bully, and realize when you are indeed being one. There may be no cure for this ugly culture, but there is fixing what role we play in it. Excellent post, you just put into words part of the reason I can’t stand most reality TV. I do like one singing competition, but it’s not about humiliating people and making them feel bad. Thanks for stopping by Jamie! You must be talking about The Voice, which is my one and only reality guilty pleasure. I used to watch Idol but it was too much about humiliating and then became extremely commercialized (more so than it was. )When The Voice came along it was refreshing and I dumped Idol. It is hard to bear much of what is out there and I think it has a negative effect on an overwhelming amount of people. That’s exactly the show I’m talking about 🙂 I agree- it’s very refreshing that the show is about discovering talent from ep 1 instead of spending weeks laughing at the bad singers. I admire you for speaking out, Butterfly. Thank you. The cruelty that frequently appears on blogs and in comments on newspaper web sites can be infuriating. You’ve hit on something when you say: “Out of every great change in technology or evolution of entertainment comes something ugly.” Maybe there is no apparent cure, however your putting out words to support the thirteen year old on YouTube in spite of her attackers sends positive energy and reminds me that on balance the internet offers more good than bad, such as your wonderful site. Thank you Garrett! 🙂 The worst I have seen is on YouTube. People are SO CRUEL there. It is saddening. These people abuse the anonymity aspect and slam whoever they can. I can only imagine what miserable people they must be. You can’t be happy if you you spend your days ridiculing others. Excellent post! I used to have a spiritual blog many years ago and suffered this a lot. Anonymous comments who would see my pic and their contribution to the discussion was that I was a fat, stupid idiot. I used to work with kids a few years ago, and even since then just day to day, I see how our culture’s celebration of stupidity has effected them. Kids who are smart are treated like they are nerds, or dorks, or gay or name the insult because they know who our president is, or can make change or use words with more than two syllables. We even see it in the writing market. Some of the best selling books are rather dumbed down in many cases. Just frustrating and not sure what to do about it. Thank you Justin for sharing your story. I know cyber bullying is a hot topic right now and there is so much weaved into where that comes from. I am so sorry to hear that you were a victim. It is a harsh reality and with the use of anonymity people go nuts. Even without it, people hide behind their computers. It is sad that the sense of doing the right thing is lost here. It’s a bit of an evolutionary process to be able to slow down and take advantage of the space before our response. It’s a practice where we’ll never be perfect but the more we practice, the easier it gets. Great post Jessica, also very sound advice. Thank you Michelle! If we all could rise above and realize what our words do, we would make great strides.